Equilux quick cleanser is a unique product for grooming. It makes possible to clean coat, mane and tail within a few minutes but without the well-known disadvantages. No need to wash the horse before application. 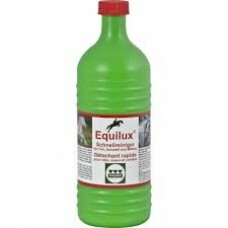 This makes Equilux an ideal product for the cold time of the year or if the horse is prone to get a cold. The unpopular yellow stains on greys or the dust layer on dark coats are immediately gone. Equilux saves a lot of grooming time. It dries quickly and does neither grease nor smell. The active agents remove stains e.g. manure stains or discolorations made by grass or dirt and create an ultra shiny coat and long hair. In addition the hair gets dirt-repellent for a longer time. For nervous horses or for stain removal in the horse’s face Equilux is available as a stain roller in a small bottle. The stain roller is ideal for taking with you, e.g. to a horse show. Equilux is absolutely non-toxic and extremely gentle to skin. Skin and hair are mildly maintained, skin breathing is not reduced. In view of man, animal and environment Equilux contains almost exclusively natural ingredients that are under constant quality control. Equilux bottles are refillable, the sprayers are reusable. We don’t add any unnecessary emulsifiers. Therefore, please do not forget to shake well before use. German riding magazine Reiter Revue International has tested special care products for white and grey horses and published the results in July 2014. And the winner is... Stassek Equilux! The test result: Equilux quick cleanser livs up ist name. It works very fast and leaves nothing but shining white hair. After the application and one or two minutes of working time, the residues are easily to erase with a dandy brush. The coat appears clean and soft. There is no need to wash the horse before the application. Equilux quick cleanser is ready to use. Spray on the dry and roughly cleaned coat or apply with a sponge, then wipe with an absorbent cloth or kitchen tissue. Persistent stains can be treated for a second time. Let the horse dry completely, brush over again with a dandy brush and the stain will be gone. Clean mane and tail in the same way.